Mom believed that spotting a cardinal, or simply finding a cardinal’s feather was to receive a message from a loved one who’d passed. The quote from Cicero was something of an inside joke—as the youngest of her children by seven years, I’d been on the receiving end of teasing from my siblings about how great life had been, how many adventures they’d had “before you were born.” Mom had encouraged me to take their light-hearted jabs as a personal challenge to dig up as many stories as I could about life before they’d been born. As a nerdy tween, I spent a great deal of time filling out genealogy charts and carrying around a portable cassette recorder for impromptu interviews with my grandparents and other seniors in my life. “You were meant to do this,” Mom had said, when I’d told her my fears about attempting to write my first novel. “Stop worrying and start writing. 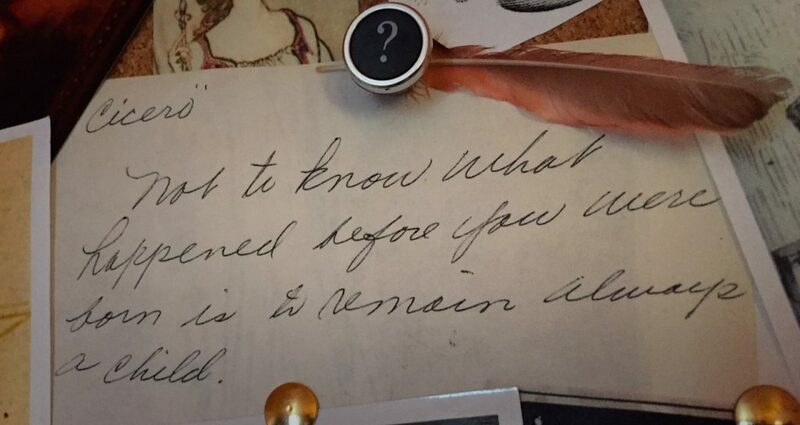 You’ve been preparing for this your whole life.” The note and feather are still pinned to a bulletin board near my desk. 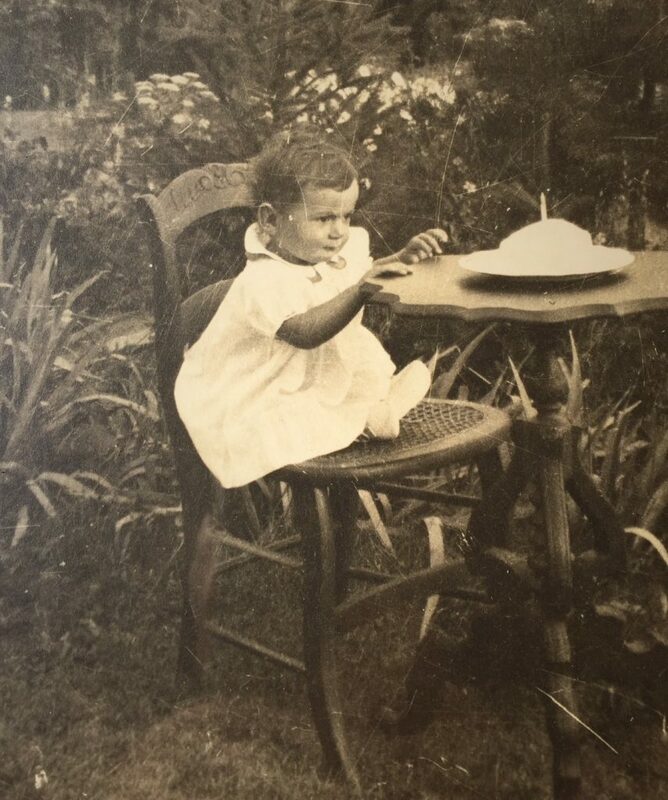 That’s Mom in her grandmother Tilly’s garden on her first birthday. Today would’ve been her 85th. Much of the first few years of her life were spent in and near her grandparents’ home in Saline, Michigan. My grandparents had even lived there for a time after Mom was first born so they could have some extra help as they found their footing as a new family. 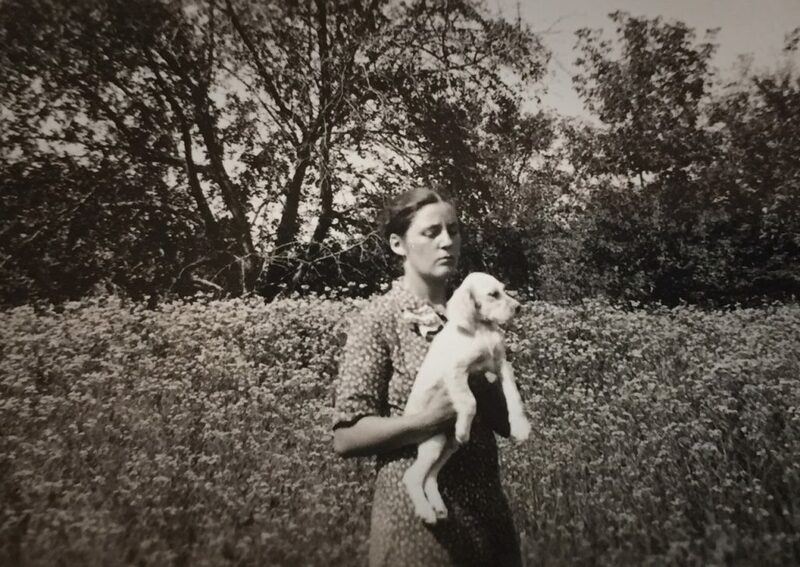 Mom stayed with Tilly and “Waboo” (her nickname for her grandfather) whenever her parents needed to travel for their newly established business of raising and showing purebred cocker spaniels. 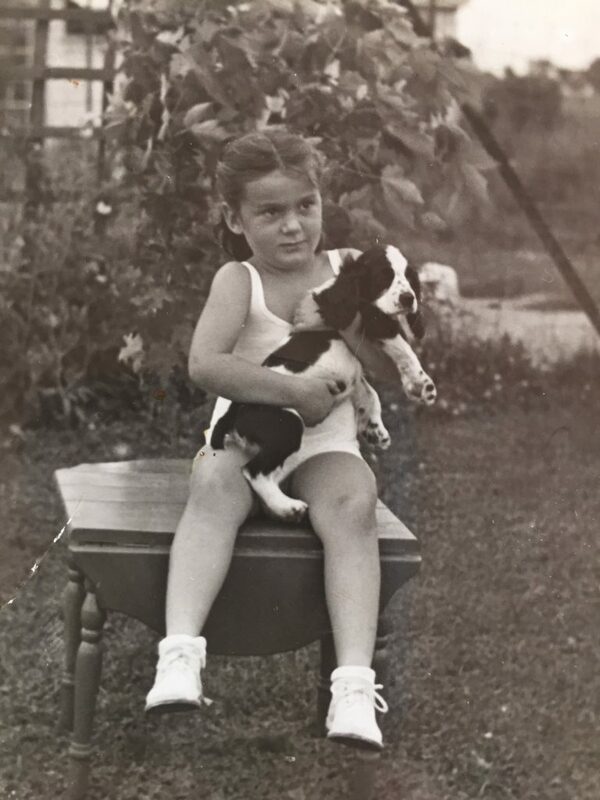 My grandmother, Alice with a cocker spaniel puppy. —March 5, 1936, the Saline Observer. I’ve read through nearly every issue of the Saline Observer from 1900 to 1951, (the years my great-grandparents lived in that town.) The paper is filled with references to their family’s accomplishments and ventures alongside their misfortunes, illnesses and deaths. 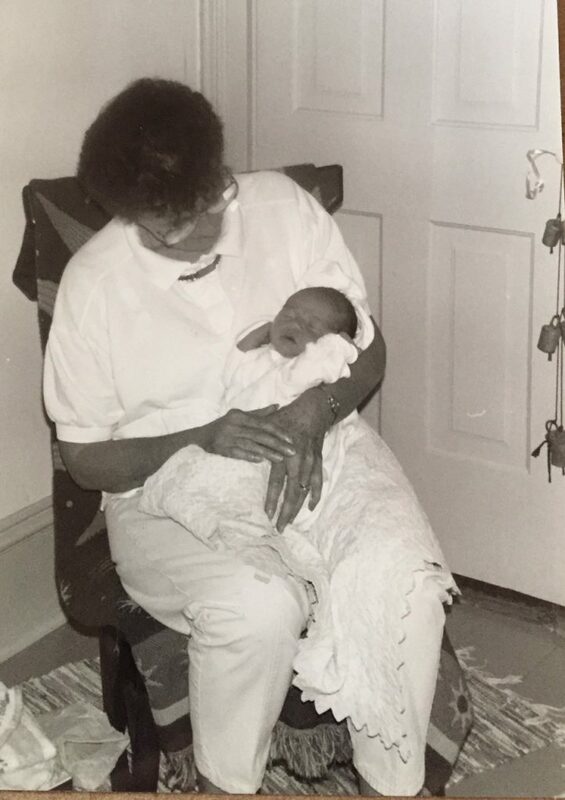 By the time my mom was born, her grandmother Tilly had lost six of her nine siblings to cancer. She’d had cancer twice herself, (uterine and colorectal) but she’d been the first in her family’s long line of cancer sufferers to get through surgery and survive. The family’s misfortune along with their passionate dedication for keeping personal stories of the disease would eventually lead to the discovery of a genetic disorder called Lynch syndrome and some of the biggest breakthroughs in modern genetics. Mom in Tilly’s rocker holding my son Ian. He’s wrapped in a quilt Tilly stitched by hand. My mom was there for the birth of my first child. She was waiting for me when I brought him home from the hospital. Whenever I needed a soft place to land as a new mother (while I was writing my graduate thesis, when my relationship fell apart, when the noise of Chicago became too loud) she and my dad welcomed me home with open arms. Family was everything to them. I’ve spent the last year working steadily on a memoir about my family’s history with cancer research. Along the way it’s also become a story about my quest to make sense of everything my mother passed down to me from my ancestors. They were amazing people, who despite their suffering, spoke the truth and worked to change the course of history. They were also human and made mistakes—and this, perhaps more than anything else, gives me great comfort. So, on this 85th anniversary of my mom’s birth, I’m thinking of the many gifts she gave me—among them, a passion for unearthing the truth, a dedication to caring for others, and a desire to always get to the heart of the matter. She always said that her birthday came at the most bittersweet time of year—summer wanes as kids go back to school, crickets swell in a melancholy chorus as birds snitch the last lonely blueberries from the bushes while we wait for the apples to ripen. When she spoke about these things she was tender and open rather than sad. She understood that life is about change, and that the past, while not perfect, affords the best view of the future. Happy birthday, Mom, and thanks for everything. Guess it’s time I got on with it. 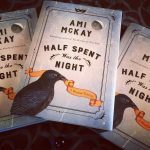 If you’d like to learn more about my memoir-in-progress, you can read about it here: Daughter of Family G.